“Is it the cost?” I asked her at the dental office in Mexico. At age 68, she had all her loose top teeth extracted. She knew she wanted implant supported dentures, as opposed to conventional removable dentures. Most people who call us (here at Dayo Dental) want non-removable false teeth to replace all their missing teeth. She chose the snap in dentures supported by 4 tooth implants, which cost $5,700. She knew what mattered the most for her, so Denture Implants were an easy decision. She wanted to be able to snap off the permanent denture from the tooth implants, brush them quickly, and snap them back in her mouth. “I am a stickler to having my mouth super clean,” she said. Missing teeth? Most people can’t make an easy decision among the various tooth replacement options. These are life-changing decisions that would affect your smile, appearance, lifestyle, and budget. Before and after of full mouth tooth replacement performed by a dentist in Los Algodones, Mexico. We will outline in detail the pros and cons of your various tooth replacement options. Many dentists talk you into the suboptimal teeth replacement option because they don’t have your best interest in mind. That’s the truth. Here’s an example of an All on 6 Dental Implant procedure. It’s a Fixed Bridge supported by six dental implants. This full implant procedure is a permanent denture, compared to the snap on Implant Denture. You can spot these types of dentists by educating yourself. And you avoid marketing gimmicks that don’t put your best interest first. We speak to dozens of patients every week who want full arch implant teeth replacement in Mexico. Some have a specific treatment in mind but were not presented with all their replacement teeth options. It’s not that some people have the wrong treatment in mind; they don’t have the optimal treatment in mind. Want a better investment, long-term prognosis, or experience tasting food? Everyone has unique needs, priorities, and jawbone structure. Some want a permanent bridge; some want a snap on denture. Each replacement teeth option provides the best benefits based on your priorities. Full mouth denture implants give you that perfect Hollywood smile. And you can eat just about anything with them. Denture implants are the first entry among full mouth reconstruction using tooth implants. They are the least expensive option, but no less effective. If you can’t stand wearing conventional dentures, you can invest in Denture Implants. They are more comfortable and less bulky in the mouth. You won’t have to worry about your removable dentures dislodging when you laugh. Dentures implants are a big confidence booster. They give you that perfect smile makeover. And you can eat just about anything with them. Steak? Corn on the Cob? Yes and Yes! Many dentists skip presenting this implant teeth replacement option for various reasons shown at the end of this article. Most people also want fixed / permanent bridge for their fake teeth. But snap on teeth have excellent advantages that might apply to you. The distinctive feature of denture implants is that they snap on and off the tooth implants. That means you can remove the false teeth yourself to clean them, such as when you brush at night. But they are very secure. You would have to abuse your snap in dentures for the fake teeth to snap off by itself. You follow a special technique to snap the entire false teeth off your mouth using your fingers. 1. Pros: Denture implants cost the least. Denture implants are the least expensive among all the implant teeth replacement procedures. The most common type – dentures secured with 4 tooth implants – cost almost half as much as All on 4 dental implants. The most common type of Denture Implants is Snap on Dentures Supported by 4 Dental Implants. This image shows a full mouth restoration using 4 tooth implants per jaw. 2. Pros: Snap in Dentures are the easiest to clean. My Mom chose Overdentures because they are easy to clean. She likes the ability to snap the false teeth off at night to brush them. She can brush the fake teeth and the implant abutments on her gums while the permanent dentures are out. Then, she snaps back the implant denture before going to sleep. Easy. Sample Locator Overdenture Implant System (LODI). The Overdentures snap on and off the tooth implants. It allows so quick and easy cleaning of your mouth. In some nights, she likes the comfort of taking the implant dentures out completely all night. Hate flossing? You have to keep up with your dental hygiene, even with tooth implants. Your old habits are hard to change? Just get Denture Implants, you get into less trouble. You won’t need to floss at all. In contrast, you need a special floss or water pick to clean between the false teeth and gums with a Fixed Bridge. It can get frustrating for people who don’t have patience. Snap on Dentures are a great option if you are not very good at keeping up with your dental hygiene. Some older patients prefer implant dentures for teeth replacement for the same reason. As we get older, our hands’ motor skills deteriorate. It gets difficult to floss between the fake teeth and gums, as with a permanent bridge. Something got stuck in implant dentures while eating at a restaurant? No problem. Go to the restroom, snap them off, rinse, and snap them back on. It takes less than 2 minutes. 3. Pros: Your permanent dentures are easy to repair or upgrade. Your repair cost is lower if one of the tooth implants fails after several years. The acrylic permanent denture is less expensive to replace than the Fixed Hybrid or Zirconia Bridge. By the way, your dentist can add 2 or more implants at any time to upgrade your snap in denture to a Fixed Bridge Teeth. We’ve had clients start with Denture Implants due to budget constraints. They upgrade to a Fixed Bridge teeth replacement at a later time. 4. Pros: The acrylic material on the implant denture cushions thin bone. The acrylic gums in dentures implants act as cushion for your jawbone. You wear out the acrylic instead of your jawbone. Your bone starts to recede once you lose your permanent teeth. Many people who have been missing teeth for a while have thin and soft bone. Top Mexico dentists recommend Denture Implants because you get more cushion and support. The flexible acrylic absorbs some the biomechanical pressure instead of your bone. It acts as a cushion. Denture Implants would allow you to avoid invasive bone grafting procedures. It also prevents more bone loss on thin bone. You may want fixed and non-removable teeth. But, your bone structure dictates the best solution to replace your missing teeth. 1. Cons: You can’t taste food as good as a Fixed Bridge because of the palate on the permanent denture. Your Mexico dentist can minimize the size of the fake gums by adding a bar to connect the 4 dental implants. It also avoids having a palate on your upper jaw implant dentures. Overdentures need thicker acrylic gums. With fewer implants, the snap on teeth needs the fake gums for stability and support. Your upper implant dentures may also need a palate if you don’t have good bone for support or if you opt for less than 4 implants on the upper jaw. Don’t like the thick gums or palate? You can decrease the size of the palate and the Implant Denture gums if you opt for 6 tooth implants per jaw. Your dentist can also use a bar to connect 4 or more implants to support your implant denture. 2. Cons: Most people want fixed teeth to replace their missing teeth. These implant dentures have to come out, which is why many of us prefer the fixed replacement teeth. You may be dreading the idea of your wife catching you in the bathroom with your dentures out. Afraid that someone discovers that your perfect Hollywood smile is actually fake teeth? God forbid, you forget the implant dentures somewhere. My Dad took off his dentures once while watching TV. He dozes off. He woke up, but couldn’t find his dentures. It took half a day to realize that the dog was chewing on his false teeth in some corner of the house. Barky looked like he was trying them on. Mom was laughing hysterically. Replace your missing teeth with a Permanent Bridge Teeth, if your mind is on hyperdrive with such scenarios. The false teeth on Denture Implants will have to be replaced after several years, just like regular dentures. Some people have their fake teeth last 7 years, some 12 years. It depends on how you take care of them. Implant Dentures supported by locators have clips or o-rings that need replacement every 1 year. It depends on your usage. Each tooth implant supporting the permanent denture has a clip attachment. You can replace them yourself. It’s easy. But, each of those clips costs around $20. Any dentist can order them for you, so you don’t have to go back to your Mexico dentists to get them. Denture Implants are the most affordable solution to replace your decayed teeth. Your transformation is often dramatic. Snap on dentures are a big confidence booster. Plus, you can eat just about anything with them. Call Dayo Dental at 877-987-3296 to find out how you can get affordable Denture Implants in Mexico. Rafael is an 71 year-old man from Florida. He called us and requested to travel to Cancun, Mexico for a Fixed Zirconia Bridge. We discussed all his tooth replacement options. He realized that given his age, budget, and priority, he was better off with Denture Implants. First, he said he was 71. He doesn’t care so much about glamour. He cares more about enjoying his food without worrying that his false teeth might fall off. Second, he didn’t want to spend too much on tooth replacement given his fixed income. Third, he realized that as he ages more, he would have a hard time flossing to maintain the Fixed Bridge teeth. Denture Implants were the perfect solution. The dentures snap on the tooth implants. You can remove snap on teeth yourself to clean them. 2-6 implants per jaw. The most common is 4 tooth implants per jaw. 4-8 implants per jaw. The most common is 6 tooth implants per jaw. 4 implants on the front jawbone secure a fixed denture. You can get the temporary denture attached to the implants with good bone. Note: You can also get full Zirconia prosthesis / bridge if you have good bone. Similar to a Fixed Hybrid Bridge, but it uses Zirconia material for the entire frame of the bridge teeth. 6-8 implants per jaw. The most common is 6 tooth implants per jaw. Fixed Bridge is second type of full arch tooth implant replacement. As the name suggest, your false teeth are permanent or non-removable. Only the dentist can remove the replacement teeth during your regular dental cleaning. Fixed Bridges are more expensive that Denture Implants. They generally need more tooth implants, around 6 to 8 per jaw. All on 8 Fixed Hybrid Bridge. The patient received 8 dental implants to support a fixed hybrid bridge on the upper jaw. Fixed Hybrid Bridge is the most common permanent implant teeth replacement for the upper or lower jaw. The dentist installs 6 – 8 dental implants per jaw to support the permanently placed fixed teeth. Top dentists prefer the Fixed Hybrid Bridge because they are strong and stable. He can balance your bite forces by identifying the best location of the implants on your entire mouth. The dentist can install a full set of replacement teeth (12 – 14 teeth per jaw), compared to only 10 teeth with All on 4 dental implants. Metal Frame – made from high-quality metal alloy or titanium. Fake gums – made from high-quality acrylic or composite. The combination of these 3 materials makes your full teeth replacement strong. They are flexible enough to avoid breaking. You also won’t have the palate and thick gums like the ones for Denture Implants. Finally, the materials are light enough to avoid bone loss. 1. Pros: The false teeth are non-removable. Most people want fixed replacement teeth. Fixed false teeth are the closest thing to having your original permanent teeth. You’ll have a beautiful smile without anyone knowing you have false teeth when done right by a top dentist. 2. Pros: You can enjoy and taste food better. Hybrid Fixed Dental Bridge is fixed, thin and light. It’s a popular alternative to removable Implant Dentures. Your natural palate and gums help in the entire experience of enjoying the food. The shape of a Fixed Hybrid Bridge is like a palateless “horseshoe” with thin gums. It allows you to taste and feel the food better. The permanent bridge is thin, light and more comfortable to wear. In contrast, Denture Implants have a fake palate and gums that cover your natural gums. 3. Pros: Your full teeth replacement is softer on the jawbone because it is not as heavy. Fixed Hybrid Bridge is lighter than Fixed Zirconia Bridge. This is an advantage especially on the upper jaw. 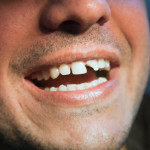 Upper jaw implant teeth replacement is more subject to gravity. You need better bone to hold permanent teeth on the heavier Fixed Zirconia Bridge. Those people who are not as fortunate to have good jawbone can opt for Fixed Hybrid Bridge. 1. Cons: Fixed Hybrid Bridge needs more implants. Implant dentists typically use 4 tooth implants per jaw to secure Overdentures. Fixed Hybrid Bridge typically need 6 to 8 implants per jaw to stabilize the false teeth. Fixed Bridges require more dental implants per jaw to replace your missing teeth. Your Mexico dentist normally uses 6 to 8 implants per jaw to hold the permanent false teeth. 2. Cons: The acrylic material tends to accumulate bacteria and stain after several years. The acrylic component of a Fixed Hybrid Bridge is more porous. This tends to accumulate bacteria after several years. This also occurs with Denture Implants, which uses acrylic material. But, the false teeth in a Denture Implant are less expensive to replace than the false teeth in a Fixed Bridge. You can reduce this issue by maintaining good daily oral hygiene. Your dentist also cleans and disinfects your replacement teeth professionally during your cleaning appointments. Dr. Ever in Los Algodones, Mexico has a more robust technique to clean your false teeth replacement. He removes your fake teeth and sends them back to the lab for a week to replace the acrylic part. No worries, you’ll wear a temporary denture while waiting for your permanent teeth. Your permanent bridge teeth will be good as new when you get them back. The resin / composite used on the actual teeth also tend to stain after a long time, although not as much as acrylic. But, the newer composite materials are more resistant to stains. They maintain their color. It’s all the more reason to go to a top dentist to get the best possible material for implant tooth replacements. 3. Cons: All Fixed Bridges are harder to clean than Denture Implants. You have to use a special floss or waterpik to clean in between your Fixed Bridge and natural gums. Maintain good oral hygiene to ensure the longevity of your dental implants and permanent dentures. You have to brush and floss regularly with Fixed Bridges. The hardest part is cleaning between your natural gums and the implant teeth replacement. You have to use a special floss or Waterpik to clean under the false teeth. But, you can ruin any fixed teeth restoration if you have bad dental hygiene. This is true for Fixed Hybrid, All on 4, or Zirconia Bridge. With bad hygiene, food particles trapped between your gums and false teeth can cause infection around the tooth implants. Infections can eventually cause the implants to fail if untreated by your dentist. Try googling “peri-implantitis”. So be good to your second set of teeth. And visit your dentist regularly for cleaning and checkup. Chelsea is a 58-year-old candidate for full mouth extractions and tooth implants. She needs 25 full mouth extractions. She also wants fixed teeth. She doesn’t want snap on implant dentures. Her local dentist in Oregon recommended full upper and lower All on 4 dental implants. She sent her CT Scan to Dayo Dental to get an estimate on her teeth replacement cost. Dr. Ever, an implant specialist in Los Algodones, performed the CT Scan pre-evaluation. He recommended that she is a better candidate for Fixed Hybrid Bridge. She had good bone in her molar areas. Dr. Ever can use 6 tooth implants per jaw, as opposed to only 4 tooth implants on the All on 4 procedure.. Dr. Ever would still use the top implant brand Nobel Biocare. However, all the implants would be vertical implants that can carry more load. Her false teeth would have more support with more implants. Plus, the fake teeth would be thinner. Chelsea didn’t mind wearing temporary removable dentures for 3 months. She completed the entire Hybrid Fixed Denture procedure in two stages. Dr. Ever is one of the top implant specialists in Los Algodones, Mexico. He uses only the most modern techniques and best materials to complete your Fixed Bridge Procedure. His courses in cosmetic and oral implantology are often sold out. Contact Dayo Dental at 877-987-3296 to get a package cost estimate for your full mouth implant procedure. Place 12 tooth implants, 6 on the upper and 6 on the lower. Wait 3 months to heal. Place the permanent Fixed Bridge teeth. Chelsea saved $31,000 from her local All on 4 quote ($54,600) by going to Mexico. She also got 2 more implants per jaw. Her implant teeth replacement have more stability and longevity. She transformed her smile and her life in 4 months. All on 4 Dental Implants are the most recognizable name among the implant tooth replacement options. Nobel Biocare, the original manufacturer of the All on 4 procedure, coined the term “All on 4”. The dentist places 4 tooth implants on the front section of the jawbone. Two of the four tooth implants are angled to anchor the Fixed Bridge. All on 4 Dental Implants are one of the most popular full implant teeth system. Also called “Teeth In A Day”, you can get your temporary full teeth immediately attached during the extraction and implant surgery. The term “All on 4” is so popular that some dentists even (loosely) refer to Denture Implants supported by 4 implants as “All on 4”. But you are not the average patient. You are educating yourself about all your tooth replacement options. All on 4 Dental Implants is the quickest way to get a full set of teeth attached to implants. Given the right conditions, your dentist can do the following in one day: 1) extract all your teeth, 2) place 4 implants, 3) attach a temporary but fixed denture to those implants. The composition of the false teeth is the same as a Fixed Hybrid Bridge. The frames are metal, fake gum are acrylic, and teeth are resin / composite or acrylic. You can upgrade to a Zirconia fake teeth, but you need to have good bone, which we will discuss later. Two of the four tooth implants are angled with All on 4 dental implants. The tooth implants are installed on the front jaw bone. Reason 1. You don’t have good bone in your molar area. You may need bone grafting or sinus lift if you don’t have enough bone to support tooth implants. Your dentist can avoid this altogether by placing tooth implants only in your front jaw. Reason 2. You have good bone in your front jaw. Of course you need to have good bone in your front jaw to support the All on 4 tooth implants. If you don’t have good bone in you front jaw, you may be a better candidate for Fixed Hybrid Bridge. Reason 3: You can’t stand wearing temporary conventional dentures, even for 3 months. You’ll have to wear temporary dentures for Denture Implants, Hybrid Fixed Bridge, and Zirconia Fixed Bridge. You know – the kind of fake teeth that needs denture glue. Standard tooth implants need 3 to 4 months to heal inside the gums before taking the load of the final permanent teeth. This gives the dental implants enough time to integrate with your own bone. With All on 4 Dental Implants, 2 of the 4 tooth implants are angled to support the fixed temporary denture. You walk out of the surgery with secured teeth, all in one day. Presto, no denture glue. Hence, these implant teeth replacement are also called “immediate load implants” or “teeth in a day”. 1. Pros: You get faster results with two stages, including multiple extractions. Do you have the right bone condition for All on 4 Dental Implants? If yes, you get all new teeth in a day. Your oral surgeon extracts all your teeth. He places the 4 tooth implants. Then he attaches the temporary dentures to the implants. You let the implants heal for 3 – 4 months. After, your dentist will remove your temporary denture. Finally, you’ll get your final permanent replacement teeth. Snap in Dentures, Fixed Hybrid Bridge, and Fixed Zirconia Bridge may need an extra stage. This happens when you need complex full mouth extractions and bone graft. 2. Pros: You can avoid wearing temporary removable dentures. This image shows what temporary dentures would look like. You can avoid wearing temporary dentures if you qualify for immediate load All on 4 dental implants. Otherwise, you wear your temporary removable dentures for 3 months while the dental implants are healing. It’s not a long wait, especially if the payoff is strongly integrated dental implants that will last you a lifetime. Need to extract all your teeth but dread the idea of having missing teeth? Your Mexico dentist can attach immediate dentures on the tooth implants during the surgery. You walk out with fixed dentures attached to the implants. Yes, no denture glue. One caveat, not everyone qualifies for immediate-loading. The dentist has to see good bone quality and quantity in your CT Scan. He also has to get enough torque on the implants during the surgery to ensure that they can support the load of the immediate dentures. Torque is the tightness of the implant post (titanium screw) in the bone. When he doesn’t get enough torque, you have to settle with wearing removable dentures. It’s not so bad; you wear them for 3 to 4 months. Dentists say they can only make that final call while in surgery. But in reality, most dentists have a good idea if you qualify for immediate load implants by viewing your CT Scans. Here’s a tip. Are immediate dentures attached to the implants important to you? Ask your Mexico dentist directly if he can attach the temporary dentures to the implants during the surgery. Get a clear answer regarding his plans. 3. Pros: You avoid extensive bone grafting or sinus lift in your molar jawbone. Sometimes, dentists have to do bone grafting to place tooth implants on the back sections of your jaw. Your back jaw is where you have the most biting forces. Permanent Denture Implants or other Fixed Dental Bridges use back jaw tooth implants for more stability. With All on Four, the dentist will use just your front jaw for your fake teeth. You can avoid invasive upper jaw sinus lift or lower jaw bone graft. 1. Cons: All on 4 has less support and stability than Denture Implants, Fixed Hybrid or Zirconia Bridge. All on 4 uses long and angled implants to replace your missing teeth. Angled tooth implants can’t carry as much load as vertically placed implants. Mathematically, a standard vertical implant post can carry more load than an inclined post. Plus, you won’t have any tooth implants on your back jaw where bite forces are greater. Are you are big and strong? You should opt for Hybrid Bridge, Zirconia Bridge or Denture Implants. Are you young? Choose standard vertical tooth implants to maximize the longevity of your implant teeth replacement. This image shows the contrast between All on 4 Dental Implants vs Fixed Hybrid or Zirconia Bridge. In the top arch, the patient didn’t have enough bone in the molar (sinus) area. The dentist recommended All on 4 angled implants to avoid the sinus. In the bottom arch, the patient had good bone. The doctor recommended Fixed Hybrid Bridge to add more support and stability with six tooth implants. 2. Cons: All on 4 dental implants can only support 10 teeth per jaw. This image shows regular upper teeth and All on 4 Dental Implants on the lower teeth. The upper teeth have a full set of 14 teeth. The lower All on 4 supports only 10 teeth. You see a gap at the back area. A full set of teeth would be 14 teeth per jaw, depending on your anatomy. You can have up to 14 teeth with the other Fixed Bridges or Dentures Implants, depending on the size of your jaw. You’ll have a gap on the back of your mouth with just 10 teeth if you are a big guy. And obviously, you can’t chew as good with fewer teeth. Your dentist can sometimes upgrade to 11 or 12 teeth per jaw with All on 4 Dental Implants. This is less common. It all depends if you have enough bone support. 3. Cons: All on 4 has ticker fake gum tissue than Fixed Hybrid Bridge or Fixed Zirconia Bridge. All on 4 needs more volume on the fake gums to make up for the lack of back jaw implants. Otherwise, your implant teeth replacement may break. It doesn’t feel as bulky as Denture Implants. But you feel more volume than the thinner Hybrid or Zirconia Bridges. 4. Cons: You have to be very careful how you eat during the first 6 weeks after the implant surgery. All on 4 Dental Implants have the strictest soft food diet requirement after surgery. The immediate-loaded tooth implants are healing and supporting a temporary denture simultaneously. You have to be careful not to bite on anything hard for 6 weeks after the surgery. Yes, your temporary false teeth is fixed. But you can only eat soft foods during the first 6 weeks after your surgery. This healing period is crucial for your bone to integrate around the tooth implants. In dentistry, it’s called osseointegration. Normally, you don’t feel any pain or swelling 2 weeks after any dental implant surgery. You may get too comfortable and use your temporary teeth replacement to bite on regular food. But, your attached false teeth are not yet ready for biting. Week 3 to 6 are actually the critical time for osseointegration. You have to stay disciplined. Your behavior after the surgery is beyond your dentist’s control. Your implants can fail if you don’t follow your doctor’s instructions on how to use your fake teeth. The doctor will have to redo the entire All on 4 surgery if one of those tooth implants fail during this healing period. That’s a big setback on your cost and health. If you don’t want this hassle or risk, go with Permanent Denture Implants or Zirconia or Hybrid Fixed Bridges. You wear the removable temporary false teeth during the 3 – 4 months of healing time. The tooth implants would be inside the gums. They would be integrating with your bone without the risk of external load. Once healed, you get your permanent implant teeth replacement. Kim has a thriving career in sales in New York. Due to early neglect, she had missing teeth in the back sections of her mouth. The rest of her permanent teeth were compromised due to recurrent periodontal disease. She also needed sinus elevation if she were to get implants on her upper back jaw. Kim was very busy. She wanted as little disruption as possible in her career. She was also very conscious about her smile. She wanted to get All on 4 dental implants. Her most important reason – she did not want to wear temporary removable dentures. Not in front of her clients. She wanted a non-removable permanent bridge teeth. Fortunately, she was a good candidate. At age 45, she had good front jawbone to qualify for immediate load tooth implants. She was quoted $64,000 in New York to get full upper and lower All on 4 replacement teeth. She travelled to Cancun, Mexico twice to complete the procedure. She paid $23,000 for the entire procedure with Dr. Carrasco, Dayo Dental’s partner Prosthodontist in Mexico. She was very happy with the results. Full Zirconia Bridges are the most elegant, thinnest, biocompatible, and long lasting solution to implant teeth replacement. It is the Rolls Royce of full teeth replacement: Fixed Zirconia Bridge. No doubt, this is the most expensive implant teeth replacement procedure. But many dental tourism travelers to Mexico prefer this option the most. Why? Patient get local quotes for $55,000 to $65,000 in the US or Canada for the cost of full mouth replacement teeth. Oftentimes, that local replacement teeth price doesn’t even use Zirconia material for the false teeth. The full upper and lower replacement teeth cost of Fixed Zirconia Bridge in Mexico is approximately $27,000 to $30,000. That cost includes extractions, bone grafting, IV sedation, CT Scan, and temporary denture. What a bargain! The best possible treatment cost only half as much in Mexico. “I might as well invest in the best permanent bridge teeth,” according to most dental tourism travelers. Zirconia Fixed Bridges have two mains components. Most of the material is made of Zirconia. The teeth are coated with porcelain to create translucency and natural look. What makes this fixed teeth replacement so good is the Zirconia material. Zirconia makes up for the entire frame of the false teeth. The most common Zirconia brand is Prettau Bridge. Zirconia is the strongest material in dentistry today. It has “diamond-like” properties. Hence, variations of the Zirconia are also used in jewelry. That’s what you see sparkling when you walk in jewelry stores; the real diamonds are in the vault. Fixed Zirconia Bridges are also the most biocompatible among all the full teeth replacement options. Why? It doesn’t have micropores as you would find on acrylic. Choose Fixed Zirconia Bridge if you want your implant teeth replacement to last the longest. The top image shows a pure Zirconia mineral shaping into teeth. The bottom image shows a pure Zirconia bridge which has no color and translucency. The dental lab has to add porcelain on the teeth to create the natural color and translucency for teeth replacement. Drink coffee all you want. Your Zirconia teeth won’t stain. It’s perfect for aesthetics. The tooth surfaces of all Zirconia Bridges are porcelain material. Zirconia mineral is pure white. It doesn’t have translucency. Dentists use porcelain to create that natural translucency like real teeth. Zirconia doesn’t stain. Porcelain doesn’t stain. I would be jealous. I have real teeth. I wish I could drink coffee all day without worrying about my permanent teeth turning yellow. 2. Pros: Your false teeth does not have micro pores that accumulate bacteria overtime. Fixed Zirconia Bridges don’t have micro pores that may accumulate bacteria overtime. Hence, they are the most biocompatible material for full implant teeth replacement. The acrylic on Implant Dentures, Fixed Hybrid Bridge and All on Four teeth has some micro pores. You may have to replace your full set of teeth after several years. How long? It depends on several factors including daily oral hygiene, food, drinks, and health. Zirconia Bridges addresses that problem. Just brush and floss daily to maintain the individual tooth implants. Visit your dentist regularly. You can make your permanent teeth replacement last as long as you want them to last. Hint: “Diamonds” last forever. 3. Pros: Zirconia Fixed Bridge teeth is the strongest material for teeth replacement. Worried about chipping or breaking your Denture Implant or Fixed Bridge? Choose Fixed Zirconia Bridge. If you are big and have a strong bite, choose Zirconia Bridge. Want less metal in your mouth? The frame is pure Zirconia, strong enough to not need any metal frames, unlike Fixed Hybrid Bridge. Fixed Zirconia Bridges are like souped up permanent dentures. 4. Pros: Your dentist can make for false teeth as thin as possible. Your Fixed Zirconia Bridge doesn’t need reinforcement metal frames on the permanent bridge. Heck, it’s so strong that fake pink gum tissue is not needed for support. Your Mexico dentist can create a Zirconia Fixed Bridge with no pink (fake) gums if you have thick and even bone in your jaw. Unfortunately, most people need some pink gums in their full permanent bridge due to bone loss. Your bone recedes due to lost teeth or periodontal disease. The pink gums are necessary to create an even smile line and to balance your bite. The picture shown above is not common. Pink gums are often necessary to make up for your uneven bone and gum tissue. They allow the dentist to create the natural transition from the fake gums to your real gums. Otherwise, you may see uneven sized teeth or tissue gaps in your smile makeover. The fake gums are also required to balance your bite and smile line. This is an example of a patient with advanced bone loss. Pink gums are often necessary to make up for bone loss or uneven bone. Your dentist also uses the fake gums to balance your smile. Without pink gums, you smile might look uneven, your cheeks sunken, and your bite off. The pink gums on Denture Implants, All on 4 and Hybrid Fixed Bridge have more volume to strengthen the false teeth. They also use the pink gums to make up for uneven bone and natural gum tissue. Your Zirconia Fixed Bridge teeth may still need pink gums, but not as thick as the other procedures. A top dentist can create your perfect smile with Dentures Implants, Fixed Hybrid Bridge, and All on 4 teeth implants. Zirconia Bridge makes for a gorgeous and longer lasting missing teeth replacement. This is an example of Zirconia Prettau fixed bridges by Zirkonzahn brand. Zirconia bridge is the most natural looking implant teeth replacement. You can choose the color, size, and design. In this image, the patient preferred to bottom full teeth to be slightly crooked to give the appearance of natural teeth. 1. Cons: Zirconia Bridge is the most expensive implant teeth replacement. Zirconia begins with blocks for pure Zirconia mineral. This material is expensive to mine and import, including from sources like Italy. The hardness of the Zirconia material contributes to the lab cost. They are not easy to shape into a perfect set of fake teeth. It takes a lot of time, even with special grinding or milling equipment. Dentists also use specialty laboratories that are often not in their area. The Zirconia prosthesis alone (excluding the dental implants and oral surgery) could cost you $12,000 to $18,000 in the US. With a Mexico dentist, the Zirconia false teeth could cost $6,000 to $7,000. 2. Cons: Not everyone qualifies for Zirconia Bridge. The Zirconia frame and the porcelain teeth surface are heavier materials. The fake teeth are heavier than those in Dentures Implants, All on 4, or Fixed Hybrid. It requires that you have good bone quantity and quality to support the weight. Your bone starts to recede when you lose your teeth. If you haven’t had teeth for a while, having enough bone is an issue. Periodontal disease also causes bone recession. There are four types of bone – Type 1, 2, 3, and 4. Type 1 is the strongest bone. Type 4 is the least. You have to be in the Type 1-3 bone range to qualify for Fixed Zirconia Bridge. The type 4 bone may not be strong enough to support the tooth implants for the long term, especially with the heavier zirconia teeth. In this case, you may be a better candidate for the lighter materials in a Fixed Hybrid Dental Bridge. 3. Cons: Fixed Zirconia Bridge is harder on the jawbone because it is rigid. Your car’s shock absorbers act as cushion. That’s why you can drive your car 200,000 miles through uneven roads and occasional bumps. You wear out your shock absorbers instead of the rest of the car components. Acrylic acts as that shock absorber. It’s an excellent flexible material. That’s why dentists use them for permanent Denture Implants, All on 4 or Fixed Hybrid Bridge. You wear out the acrylic instead of your jawbone. Zirconia is rigid, like a rock. It’s another reason why not everyone qualifies for Zirconia fixed teeth. It you don’t have the right jawbone, your false teeth will wear out your bone. It’s too costly if a tooth implant fails after several years. You would incur the cost of the failed tooth implant and the cost of new Zirconia fake teeth. Unfortunately, you can’t reuse the same Zirconia permanent bridge. Each permanent bridge is custom made for a specific set of teeth implants. John, a 32 year-old college professor, contacted Dayo Dental for full mouth reconstruction. He decided to have all his teeth removed because of misaligned bite and multiple dental problems. He prefers to have a fresh start with teeth implants. He wanted to invest in fixed teeth that will last him 30 years at least. He also did not want anyone, including his young children, to know that he has false teeth. He had excellent jaw bone. Given his public profile, his smile was so important for him. He invested in Fixed Zirconia Bridge to get the best possible smile makeover and longevity. 1. Denture Implants – best if you want to clean your replacement teeth easily on a daily basis. 2. Fixed Hybrid Bridge – best fixed teeth replacement for all types of jaw bone, age group, and body type. 3. All on 4 Dental Implants – best implant procedure for 3 reasons: 1.) you don’t want to wear temporary removable dentures, 2.) you have good front jawbone, 3.) you lack enough back jawbone to support teeth implants. 4. Fixed Zirconia Bridge – best if you want the fixed replacement teeth to last the longest. Don’t know which option to replace your missing teeth? Yes, it can be a bit overwhelming. You have to choose the type of implant procedure, number of implants, permanent bridge material, and timeframe. Your decision cost thousands of dollars in teeth implant work. It has lasting effects your health, appearance, and lifestyle. Most people are completely reliant on the dentist’s recommendations. To make matters more complicated, some dentists don’t always put your interest first. You get an implant procedure that is not optimal for your own unique needs and jawbone. But we are here to educate you with insider information. Be aware of these unethical behaviors and marketing gimmicks. It will help you find a dentist that you can trust. You can have a full set of 14 teeth with Denture Implants, compared to only 10 – 12 with All on 4 dental implants. Denture Implants also cost half as much and are easier to clean. The bigger the cost of the treatment, the more revenue the dental office gets. Denture implants are the least expensive among all the implant teeth replacement procedures. But, it’s not the go to procedure for most implant dentists. All on 4 Dental Implants are quick revenue for the dental office. They cost approximately $50,000 to $65,000 for a full mouth in the US. You pay for the bulk of the cost upfront during the first surgery. Teeth-in-a-day is big revenue for the dental office on any given day. Dentists don’t need to wait for longer healing periods for bone grafting. But what if All on 4 dental implants are not the best option for your type of situation? A good dentist analyzes your situation and presents all your options. He recommends an implant teeth replacement that’s best for you. It might take longer to complete and he makes less money, but he puts your interest first. In some cases, unethical dentists would rather extract all your teeth than save them. We see many cases of patients needing full mouth extractions and implant teeth replacement. But some can clearly avoid these invasive procedures by doing full mouth crown restoration. Dentists make more money from All on 4 implants than full mouth restoration with crowns. Dentists need advanced implant training and experience for full teeth replacement procedures. Dental Implant courses are expensive. The actual hands-on experience is even harder to get, especially for US dentists. An Arizona dentist might take a theory course in Michigan. But he can’t perform a live tooth implant surgery in the course because he is not licensed to practice in the state of Michigan. Someone trained in All on 4 may not be trained for bone reconstruction or sinus lift for Hybrid Fixed Bridge or Fixed Zirconia Bridge. The best dentist is someone who has extensive training and experience in ALL the types implant teeth replacement. Here’s a guide to help you choose a dentist when getting dental implants in Mexico. A periodontist or oral surgeon may likely recommend extracting all your teeth. He is bias towards implant teeth restoration and permanent dentures. You may go to a prosthodontist who recommends saving all your teeth. He is bias towards a full mouth restoration using dental crowns. You can taste food better and have a better overall lifestyle by keeping your own natural teeth. Who do you follow? You can opt for 6-8 dental implants per jaw with Hybrid Fixed Bridge or Zirconia Fixed Bridge. You create more stability in your teeth replacement if you qualify for more dental implants beyond the four with All on 4 fixed bridge. In this image, the dentist in Mexico just placed healing abutments to ready the implants for actual implant abutments. This patient is getting the maximum 8 dental implants on her bottom jaw. Dentist sometimes refer to this procedure as All on 8 dental implants. Some dental offices, especially dental chains, are pre-disposed towards one implant teeth replacement option. They tend to recommend one homogenous treatment for everyone without discussing all your options thoroughly. Some reasons include meeting quotas, immediate revenue, and lack of comprehensive training. But every teeth replacement case is unique. Bone structures vary. Age, body type, and usage vary. All on 4 dental implants are the most common recommendation that fits into this category. All on 4 is an excellent treatment. But, it’s not for everyone for the reasons stated above. Top dentists in Mexico will tell you to go with standard teeth implants if those reasons do not apply to you. Standard implants are vertical implants used in Denture Implants, Fixed Hybrid and Zirconia Bridge teeth. Real reason: It’s too difficult and cumbersome to deal with restoring your teeth with crowns. We have to deal with root canals, bone grafting, and single tooth implants. Plus we have to ensure that your smile line is even and bite is balanced. Those are skills suited for a Prosthodontist. But I am just a general dentist. Real reason: It’s easy and instant revenue for us. We don’t have to deal with rebuilding your bone in molar areas to place Denture Implants, Hybrid Fixed Bridge, or Zirconia Fixed Bridge. You (the patient) get instant gratification. We are not trying to make you a cynical patient. Our goal at Dayo Dental is to educate you so you can make informed decisions about replacing your missing teeth. We want the best treatment for you as much as we want for ourselves (and our Moms). How do you get it right? Here’s an analogy. A food recipe often requires many ingredients. But, there are usually one or two key ingredients. The key ingredients are crucial to process. Without them, the food will be disaster. The key ingredient to getting implant teeth replacement is finding a qualified and ethical dentist. Dentures Implants and Fixed Bridges are complex procedures. Nowadays, almost every dental office advertises that they do dental implants. This is especially true when you travel to Mexico for dental work. But, few are qualified to do full implant teeth replacements. Even specialists don’t necessarily have the right training. Plus, cheap dentists use cheap materials on your fake teeth. These include low quality implants, corroding metal frames, or dull-looking porcelain teeth. Your general dentist may also not have the training to balance your bite for a snap in denture or fixed bridge teeth. Don’t just choose a dental office or dental chain. Don’t just go by the name and reviews of the dental practice. Identify exactly who is the dentist who will be performing the procedure before you travel to Mexico. Choose a top dentist that you can trust. What is his or her experience level for your Implant Dentures or Fixed Dental Bridges? Does he guarantee you dental work? How many tooth implants has he installed in his career? This was my Mom right before her Denture Implant surgery in Los Algodones, Mexico. She was a little nervous, but in high spirits because she knew she was in good hands. She underwent IV sedation and completed the surgery 3 hours after. At Dayo Dental, we send you to only the top 5% dentists in Mexico for these complex implant procedures. We only send you to a dentist if we are comfortable sending our moms to that dentist. You also get a 5-year Peace of Mind Guarantee from the Mexico dentist as a Dayo Dental client. Most importantly, we screen the dentists in Mexico for ethics and honesty on an ongoing basis. We don’t tolerate dishonest dentist who take advantage of unknowing patients who are at their most vulnerable state. We remove them for the Dayo Dental Network. Check out more tips on how to choose the right dentist for your dental implant procedure. Need a free estimate for Denture Implants or Fixed Bridge? Don’t know which of the tooth replacement options would be best for you? Call Dayo Dental at 877-987-3296. Let’s discuss your dental situation and schedule you with a Mexico dentist you can trust.